Read more about Nando's heading to Wednesbury! Nando's to open in Inverness by Xmas 2016? Read more about Nando's to open in Inverness by Xmas 2016? Read more about Loughborough now open! We hope to have news on our 30th Reviewer Dinner in the next few days. The provisional date is Monday 9 May at a London Nando's so keep the date free! Read more about RYNXXX info coming soon! Bolton - Vaults now open! Read more about Bolton - Vaults now open! Read more about Another Nando's for Oldham? 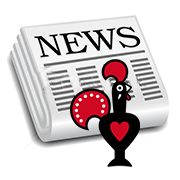 Read more about Third Nando's for Warrington? Birmingham - Resorts World now open! Read more about Birmingham - Resorts World now open!